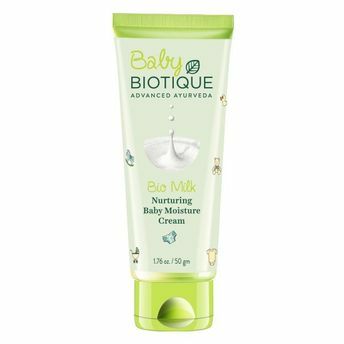 This nurturing cream is blended with pure extracts of milk protein, wheat germ, almond oil, honey and seaweed to blanket an infant's delicate skin with nourishing moisture. 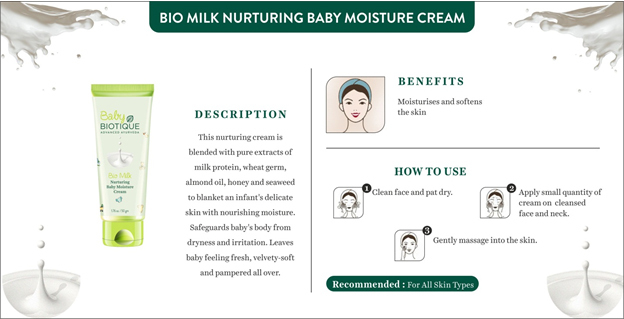 Safeguards baby's body from dryness and irritation. 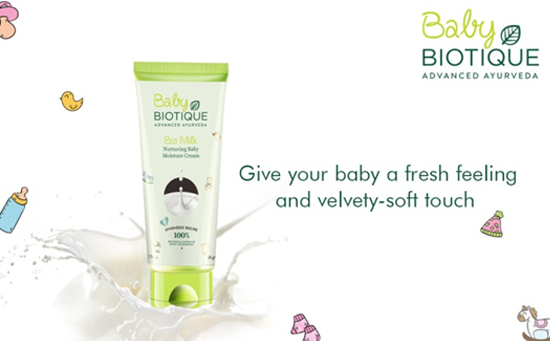 Leaves baby feeling fresh, velvety-soft and pampered all over. Dugdh (Milk) 2.0%, Khamir (Saccharomyces) (yeast) 3.0%, Ankurit gehun (Triticum vulgare Germinated) 1.0%, Badam tail (Prunus amygdalus oil) 1.0%, Surajmukhi (Helianthus annuus) 1.0%, Madhu (Honey Mel) 1.0%, Chinai ghas (Gelidium cartilagineum) 2.0%, Neem (Media azadirachta indica) 2.0%, Cream base Q.S. Milk Protein has been natureA s moisture booster and lightening elixir since CleopatraA s legendary bath. 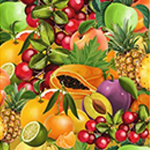 It is a rich source of vitamins and calcium to replenish skin energy. Neem has medicinal properties.It helps in healing and glowing the skin also.It has amazing moisturizing properties. Aloe Vera has been called the soothing desert lily, used for thousands of years as an elixir of youth. It is a natural moisturizer with anti-bacteria; anti-inflammatory, anti-Aloe Vera has been called the soothing desert lily, used for thousands of years as an elixir of youth. 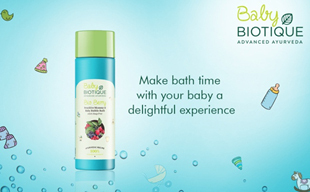 This gentle, 100% soap-free, bubbling wash is a natural blend of wild berries, sandalwood oil, honey and aloe vera to make babyA s and mommyA s bath time a delightful experience. Light-foaming, pH balanced formula refreshes and nourishes sensitive skin, without dryness or irritation, for a soft and comforting feeling. Vinita Jain began her lifelong quest to advance the wisdom of her holistic legacy for all to live and thrive on. The Himalayan Masters lived in the caves on Vinita JainA s familyA s estates, where she learned to read Sanskrit and studied the ancient Ayurveda texts. Today, Vinita Jain orchestrates a team of qualified Ayurvedic Doctors, Scientists and Swiss Cosmetologists who design, manufacture and pack all Biotique products. 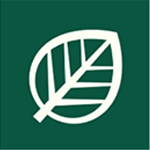 The Ayurvedic Doctors are expert practitioners in many fields of natural medicine and health care to extract natureA s full body of knowledge. The result: highly effective skin and hair care products that treat and preserve health, beauty and well-being as never ever before. 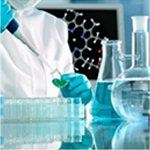 Today, Biotique personifies the ultimate in authentic Indian traditional medicine, advanced by cutting edge Swiss biotechnology - a beauty legacy built on product purity, sustainability, universality, pioneering research, development and manufacturing for over 25 years. Biotique treatments do not cover up problems - they eliminate them. With 100% natural botanicals. No chemicals. No preservatives. No animal testing. All in eco-friendly and recyclable packaging. Dermatologist Tested For Safety. Biotique products are made of 100% organically-pure, preservative-free ingredients and renewable resources - cultivated, gathered, blended and manufactured in the foothills of the Himalayas.